WE ARE NOT TAKING ENTRIES AT THIS TIME. We started this contest in 2010 and have given away one kid annually since then. Rules on how to enter are listed below. What is the KW Farms Kid Giveaway Contest? 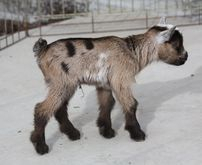 Our Kid Giveaway is a fun herd promotion contest by which we choose/draw (depends on the year) one lucky person to receive one of our Nigerian Dwarf kids at no cost. This is an annual giveaway that happens in the springtime usually, during our kidding season. We take entries up until a deadline and once closed, we choose or draw one person or family to receive the giveaway kid. The kid to be given away may be a buck, doe, or wether. 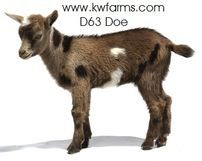 In the past, the winner was welcome to choose from any available kids, but for 2018, we have already picked the doe kid to be given away. Congratulations to our 2018 winner, Corinna Curtis! Congratulations to our 2017 winner, Maddison Reed! Congratulations to our 2016 winner, Zachary Bock! Congratulations to our 2015 winner, Chelsea Johansen and family! Good luck with KW Farms SN Night Song! Congrats to our 2014 winner, The Leib Family! Hope you enjoy KW Farms SH Carte Blanche! Congratulations to our 2013 winners, Samantha, Rebecca, and Jessica! Have fun with KW Farms LE Orchid! Congratulations to our 2012 winner, Karen Khronert! Good luck with KW Farms Princess Sassy! Congratulations to our 2011 winner, Cyndi at Five Fold Farms! Hope you have fun with KW Farms PB Twinkle Toes! Congratulations to our 2010 and first kid giveaway winner, Tisie Brasuell! Hope you enjoy KW Farms GM Kens5LeafKlover! 1) Must complete questionnaire at the bottom of page. 2) Any youth submissions must have consent from a parent. 3) If you want to enter for a buck or doe, you must have current membership to: AGS, ADGA, or NDGA. If entering for a wether, you do not need membership. 4) Plan to keep this "gifted" kid permanently. The giveaway kid is not intended for someone looking to resell. 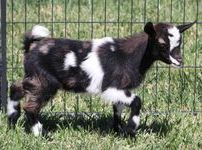 4) Be familiar with the Nigerian Dwarf breed and care requirements. 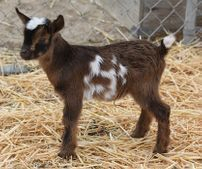 6) Have a secure and appropriate pen and shelter, at least on other goat for a companion, and be able to provide proper care. 7) Have lots of love and time to devote to the new kid. Our 2018 Kid Giveaway Contest is free to enter. To enter, you must meet the qualifications listed above and fill our our questionnaire below. Once we receive the questionnaire and you are approved by us, you will be entered in the contest. To fill out the questionnaire, you can copy and paste the questions to your email and put answers underneath them. The winner will be randomly drawn and announced on July 13, 2018. The entry deadline is midnight on July 12, 2018. We will post the winner on the home page of our website and send them the news via email. If we receive no reply within four days, we will choose someone else and the original winner will not receive a kid. The winner is responsible for picking up the kid at our farm in Wapato, WA 98951. We do not offer shipping, so any transport arrangements or shipping costs, health certificate, etc. are the responsibility of the winner. The kid will be ready to leave shortly after weaning. If the winner cannot pick up the kid within a reasonable time after weaning, a daily boarding fee may be issued. 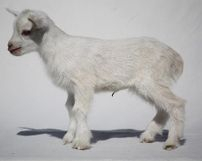 We cannot guarantee you will get a show or breeding quality goat, however you will not receive a goat that has any known faults. The giveaway kid comes with all the benefits that any of our regular kids have. NOTE: If you have entered before in a previous year's giveaway, just shoot us a message and let us know you want to re-enter since we already have your questionnaire on file. We do this giveaway as a fun herd promotion once per year. There are no strings attached. It just makes us happy to do this for someone. Have you entered our giveaway before? If so, you can skip over the rest of the questionnaire as we already have your application on file. If you need to update answers, feel free to continue. 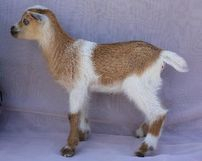 How many goats do you have currently? 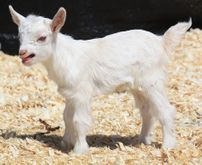 What breed(s) are your goats? What do you do with your goats? What registries/associations do you belong to? What is your herd name (if applicable)? Have you done your research on this breed and understand fencing, shelter, care, and nutritional requirements? Tell us a little about your set up, management practices, and anything else you'd like us to know. Do you want a doe, buck, or wether? What would your plans be for this giveaway kid? Tell us why you'd like to enter our giveaway.